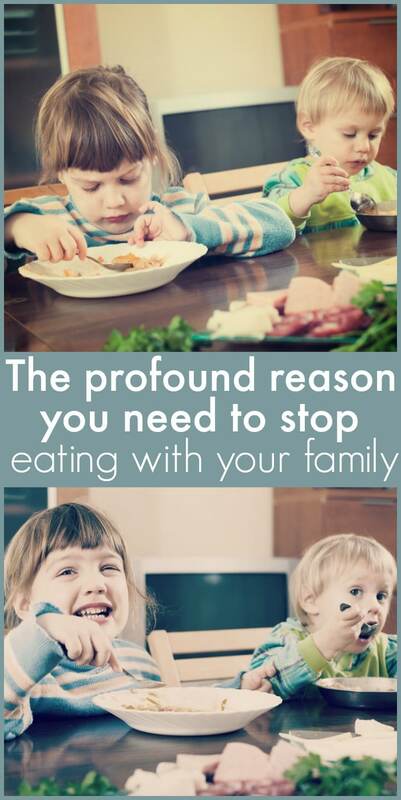 There are countless articles explaining why family dinner time is important to the health of a family. But two years ago, my family made the decision to stop eating together. It seems crazy, but we actually did this to make our family stronger. We have two small kids who aren’t great at sitting still. Any one who has ever eaten with a two year old knows that mealtime with a little one isn’t fun and games. It’s messy, stressful and not a great environment for connecting with any one. My husband works long hours so he ends up getting around one full hours with our kids every day. Now sure, we could spend this time around a dinner table, doing the stereotypical family thing. There was certainly a time I would stress myself out trying to get dinner on the table the minute my husband walked through the door. This was the only way we could finish the meal before the kids have to get ready for bed. Eating with littles means that one or both parents end up getting up and down to clean up spills, grab some extra dip or spoon feed the baby. The kids relentlessly try to eat the food form mommy and daddy’s plates and it becomes a battle instead of a picturesque dinner. When we do dinners together, it takes up 90% of the time the kids get to spend with their daddy every night. So we stopped having meals together. When my husband gets home instead of being thrust straight into a hectic meal-time situation, he comes home to two, happy, PJ clad kiddos that are ready to play with him until bedtime. I feed the kids their dinner and get them all ready for bed before he comes home so they can have quality time reading, playing and wrestling with their dad before they have to go to bed. As the kids get older meal times will become a great time for conversation and family-bonding, and I’m looking forward to that! But for now our children receive love through playtime. Those few precious minutes that the four of us have together are filled with fun, not dinner drama. Stopping family dinner time isn’t what you’d expect from a family that is actively trying to grow together, but I’m done feeling guilty that we don’t have those wonderful, Norman Rockwell-worthy dinners. This is what works for our family. It’s not perfect, but it doesn’t have to be. I’m learning that loving on our kids and finding ways that we can build happy memories together is far more important than their ability (or lack thereof) to sit still at the dinner table by the age of two. I know many families that can do it and they have happy meals together with their tiny tots (I have major respect for them! ), but that’s not our family yet. Those are skills that come with age, and I’m honestly not concerned if my toddler’s aren’t capable of sitting still or mastered table etiquette. Those things can come with time and finding what works best for our family is infinitely more important than keeping up with stereotypes and traditions. Are there cultural norms that your family completely ignores? Is your family ready to abandon the family dinner concept (for now, at least)? If you feel like you need to hit the rest button with your family right now, I want to invite you to join a free family reset challenge from one of my partners. This challenge is FULL of positive and fun resources and activities that will help you reconnect as a family and go back to laughing and enjoying each other…yes, even after a tantrum filled day with the toddler! I love it so much, and it’s my joy to offer the Family Reset Challenge to you for free! (My friend who is hosting the challenge does have a number of paid resources for moms, which I will earn a commission on if you choose to make a purchase at a later time.). Are you ready to reconnect? Sign up for the Family Reset Challenge today!!! My husband works partly from home, so he is here for almost all meals. I think your choice is a great one, because you’re right- when you have little kids, meal time isn’t exactly bonding time, and it’s not how you want to spend the precious time your husband has with the kids. I have to give you a high five, though, for doing mealtime yourself every day so your husband’s time with the kids is more meaningful. It’s not easy flying solo during meals! You know your family best and what’s good for them. Good for you. Being open to change and expecting the unexpected is imperishable important. We have totally done this same thing. My hubby has weird hours and it was more stressful than family-building. As the kids are getting older, we are doing dinner more, but not EVERY night. My family made our own bedtimes. We put our oldest to bed as early as 6:00 pm when he was little. And, like he should after 12 hours of sleep, he woke this nightowl mama up at 6:00 am. Ugh! I was consistently sleep deprived until I realized that as a homeschooling family with night owl parents an 8:00 or 10:00 pm bedtime made much more sense. My husband and enjoy our alone time around 2:00 am when the house is quiet and we know that no one will likely wake us up at six in the morning. It works for us! Good for you! I have a friend who did the same thing when her kids were smaller, and her reasoning made so much sense, as your’s does now. The pressure to eat dinner together every night is (I’m convinced) a very “American” thing. I don’t believe mom’s in other countries stress out about it the way we do. Heck, in many European countries, you are eating dinner until 9:00 p.m. as a norm — and most kids are well tucked in bed before that! You are doing the best you can for your family. Thanks for sharing this. Absolutely the best reason and I applaud you for this. Perfection is in the eye of the beholder and it sounds like what you’ve got is pretty darn perfect (imperfectly speaking, of course ;) ) We often miss out on family dinner time for one reason or another (schedules being the biggest ish) and though I am thrilled when we do gather together, I long ago stopped feeling guilty for what wasn’t, and simply enjoy what is! A lot of mums that I know (in New Zealand) do this when the kids are little – the younger kids also tend to want to eat earlier, well before the adults are ready for dinner. I did exactly the same thing when my kids were small. They are now 11 and 13 had have family dinners again. This started mostly when the kids started school as they were older and better able to sit still at the table and carry on a conversation. We’ve totally lost the family dinners thing over this past summer. All the kids activities have taken place during our normal eating time so meals have been on the fly. I’m having a terrible time getting back into the habit of fixing meals of an evening since school is starting soon. Just last night we ate out at our favorite Mexican restaurant and went to a movie to reconnect and spend some time together. I’m looking forward to having the kids home at dinner time and enjoying the evening with them again. Now, I don’t feel so bad about us all not eating together the past few months. We stopped family dinner 10 years ago and we only re-introduced family dinner 3 months ago, my baby is now 11 years old. I have one severely hyperactive child and all that family dinner time did was make the other kids and me irritable. Now she is 14 and much more able to sit still, dinner lasts about 30 minutes max and we don’t make them wait for everyone to finish eating. This is how I was brought up. People should really do less of what they think others expect from them and more of what does them and their families good, I get you I just don’t think it should have ever been enough of an issue to be a post, we have meals when we can and don’t if we can’t or if we aren’t in the mood, less rules more flexibility and quality of life. We did the same and for the same reasons. We do have family dinners on the weekends, but during the week we figured quality play time with Daddy was more important than chaotic meal time! With toddler twins, I totally get that! haha, our meal times can be so noisy that my husband and I often have “date dinner” without the kids at the weekend. I am so glad that I’m not the only one. My husband is a chef, and a foodie, and our dinnertime with 5 yr old twins is less than enjoyable for him. I used to feel guilty that I was feeding them early, and separate, but it is what works for our family. I sit with them while they eat – but he does not. He gets home and they just enjoy the time before bed. He is also very sensitive when he spends a long time making a fantastic meal, and they are picky about it. I know one day they will realize how lucky we are to have chef-made meals, but for now, it’s all about mac n cheese. . Thank you for making me feel better!! Wow your kids can’t sit still for a 15 minute dinner? That’s really sad. I bet your kids are self entitled little brats. Excuse me while I go raise good children who have decent table manners and don’t dictate my life. Hey Buddy!, I found this information for you: "Why We Stopped Family Dinner Time". Here is the website link: https://www.beautythroughimperfection.com/stopped-family-dinner/. Thank you.